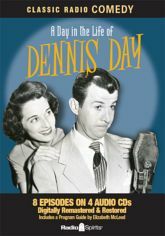 Multi-talented Irish tenor Dennis Day played a charmingly na�ve young man (not at all unlike his character from The Jack Benny Show) in his very own series. Singing and working the soda fountain in the town of Weaverville, his lyrical voice and comical ways delighted listeners for five seasons (1946 - 1951). Although he bemoaned his humble position in life, his lack of funds, and his inability to impress the parents of his girlfriend, Mildred Anderson (Barbara Eiler), Dennis never gave up trying. Bea Benaderet co-starred as the status-minded Mrs. Anderson, along with Francis "Dink" Trout as the cowed-but-kindly Mr. Anderson, and John Brown as Dennis' begrudging boss Mr. Willoughby. Includes 8 digitally restored and remastered episodes, and a Program Guide by Elizabeth McLeod.